Q: Do I need to tailor my resume to every job application I apply to? A: Ideally, yes. You should tailor your resume to every role you apply to. Each position calls for unique skills and language that hiring managers will be looking for. Yes - this is absolutely time consuming, and executing an effective job search takes time if you want your efforts to pay off. That said, your goal should really be to have a strong “master resume” you can continually work off of and tweak. An effective resume should give an accurate and compelling snapshot of who you are, what you’ve done, and what you bring to the table for an employer. Open the resume with a strong summary or objective statement (bullets or brief paragraph) that details your level of experience, target job title, and core strengths that you bring to the table. This is one of the first thing they will read, and it sets the tone for the rest of the document. It’s also fairly easy to change up in a pinch. Here’s an overview of how to write one. This resume lists out the core skill sets based on their relevance to the role. 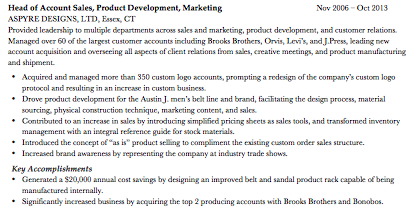 This resume example breaks out the skills by category, in this case, web development tools and methodologies. Break up your job descriptions into tasks and accomplishments. Provide a brief high-level overview of your role, followed by a few bullets that describe your core responsibilities. Under that, you can create a break-out section entitled something like “Key Accomplishments:” or “Select Projects:”. This section should highlight your impact - and can include things like special projects, accomplishments, promotions, or any other way you brought specific value to the organization. Did you increase revenue, growth, or profitability in some way? Did you work on a strategic initiative that was a success? Did you enhance the customer experience, or improve your company’s culture? Did you reduce costs? All of these things should come out here. A brief overview describes the function of the role, followed by specific bullets around the candidate’s job responsibilities and key accomplishments. The goal is to make the resume easy to tailor from the start, so that you’re not rewriting it every time. Determine the underlying message is that you want your resume to convey. In other words, what are the key takeaways that your reader should gather after reading the document? Be clear on the types of positions you’re targeting, what the core skill sets are, and the value you can bring to the table. Finally, cross-reference job descriptions and note the recurring language and keywords that are used to describe the skills and qualifiers. You found your ideal role. Now let us help you tailor your resume to maximize your chances of standing out to hiring managers. Contact us to get started. What Makes a Great LinkedIn Profile? What is a Personal Brand & Why is It Important?